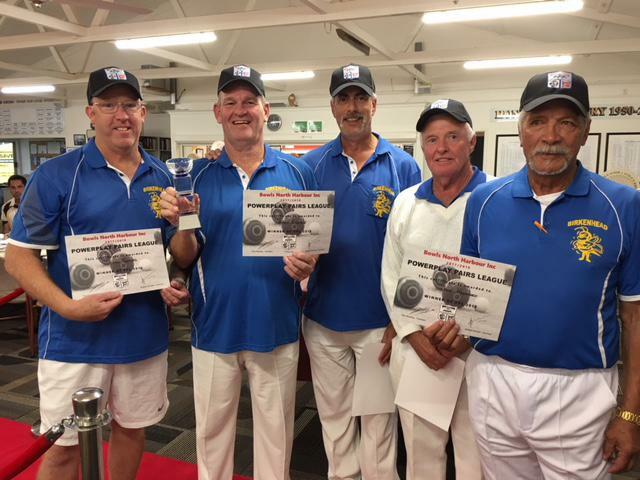 The winning Birkenhead team: Randall Watkins, John Hindmarch, Mark Rumble, Evan Thomas and Jack Huriwai. Also Ruth Lynch (not in photo). 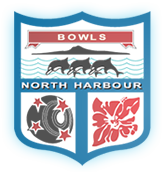 The excitement and razzle-dazzle which erupted on North Harbour greens late in the 2017-18 North Harbour bowls season will be seen again in the 2018-19 season. Bowls North Harbour chairman Graham Dorreen, who spearheaded the introduction of the Australian-style Powerplay Pairs league last season, had initially thought it would be superseded in the coming season by steps being taken by Bowls New Zealand. This was to introduce to the national calendar a similar competition, which is to operate from next February proceeding from regional play-offs into the climax of a Sunday grand final in Wellington next April 28. But rather than a replacement for Harbour’s PPL the national competition will be an addition, with one concession by Harbour being a need to shift the PPL to earlier in the season. Accordingly, Harbour’s PPL will be on Thursday evenings through October culminating in the final on Saturday, October 27. That will give clubs plenty of leeway until the national 3/5 tournament starts next February. It will also reduce the likelihood of disruption or cancellations as it will be played when daylight saving hours are in force. The PPL will follow the same quickfire format as in 2017-18. Each team will comprise three pairs of any combination playing two sets of five ends, with a one end tie-break if required. There will be the same $2000 stake, with all prize money going to the clubs rather than the players, something which the players themselves are in favour of, and something which fits Bowls North Harbour’s philosophy of clubs being a priority. The inaugural Harbour PPL finished in the most dramatic circumstances with Birkenhead narrowly edging Orewa in the final. Even though the late autumn weather was unpleasant, Dorreen described the day’s atmosphere as amazing. The presence of a band enhanced the festival feeling. Birkenhead and Orewa plus Northcote had been locked together for pretty much all the four rounds and after the first three, Northcote was actually ahead. But it slumped in the last round winning only one of its games, meaning the crucial final match was between Orewa’s Tony Rickerby and Noel Rooney and Birkenhead’s John Hindmarch and Ruth Lynch. The Birkenhead pair came out on top 7-6, 6-4 to take the title with 40 points to Orewa’s 38.5, with Northcote on 37 and Browns Bay, finishing fast by winning all three of its last games, a mere half point further back. The other finalists were Helensville, Mairangi Bay and Milford. The winning Birkenhead team in the final were Hindmarch, Lynch, Evan Thomas, Randall Watkins, Jack Huriwai and Mark Rumble. Jerry Belcher, Jimmy Heath and Connor Ennor were others who appeared in the qualifying rounds. Scattered among the seven teams were many of North Harbour’s best players. Lynch from the winning Birkenhead team has won a national fours women’s title. Black Jack international Tony Grantham was in the Browns Bay team, gold star holder and a New Zealand Open triples champion David Eades and the current centre singles champion Bruce McClintock were in the Orewa team.